Most years, I begin decorating the day after Thanksgiving. This year, for numerous reasons, I'm off to a slow start. Maybe it's due to the fact that I'll be working through Christmas this year and won't have any of the family at my house to celebrate. Some of it might be due to the fact that I'm still recovering from the loss of my Mollie Kitter. And some is certainly due to the fact that I am having a lot of pain in my hip, for which I've been busy with Dr. appointments, x-rays and MRI's among other things. 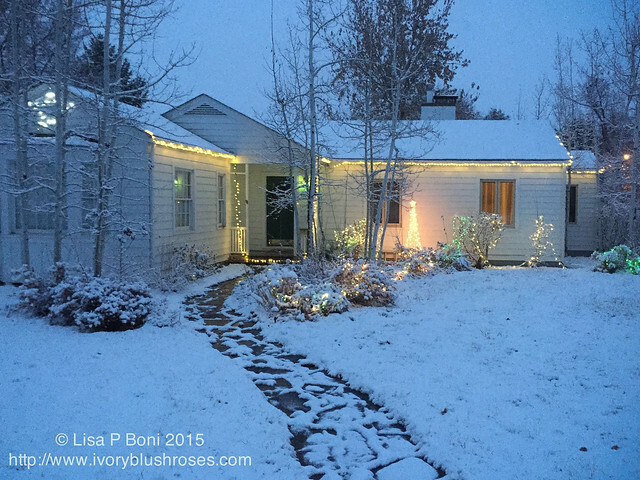 But this weekend, the decorations are up at last and along with a lovely light snowfall, it finally feels a bit like Christmas around here! 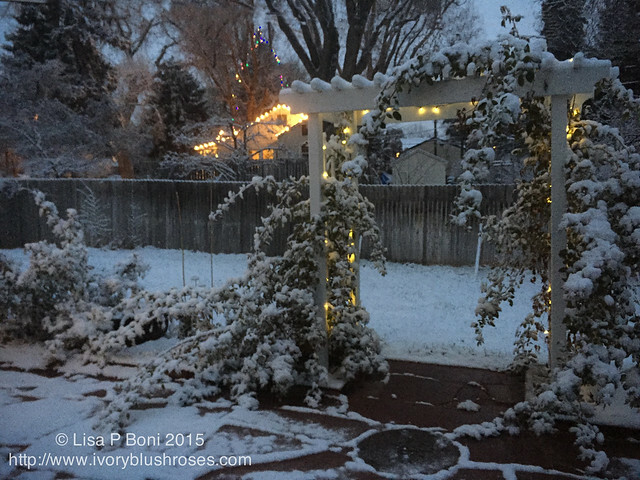 I leave the lights on the rose arbor all year long, but once the snow comes and the neighbors put out their lights, it seems more like Christmas rather than a fairy garden! I made the mistake of leaving the lights up all year and so some of them are in sad shape. My son Stephen comes tomorrow to put everything in order! He'll get those darkened spots fixed and rehang the strands that have dropped out of place! Inside, things have been kept to a minimum as I don't fancy too many trips up and down the stairs with my hip acting up. 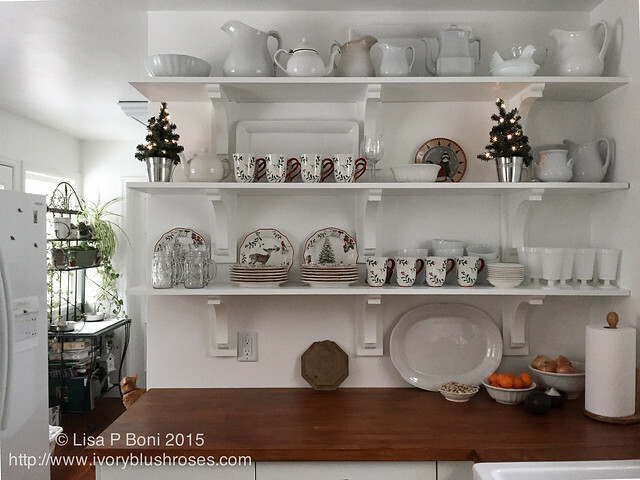 But I did get the Christmas dishes out! 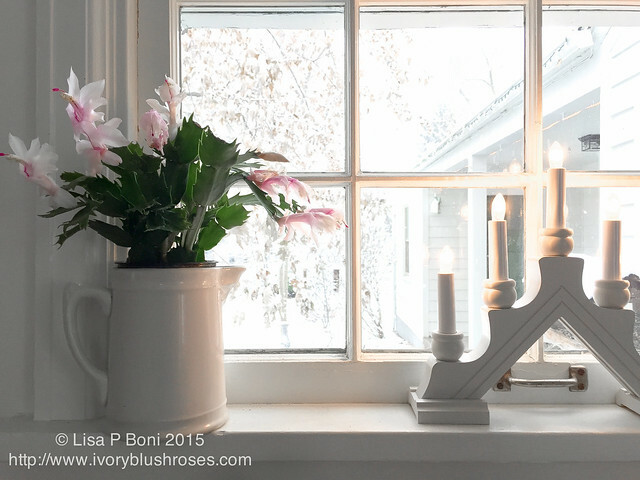 On the kitchen windowsill, a lovely Christmas cactus is blooming in shades of pink and white! I'm loving the Swedish candelabra lights that I brought home from Lindsborg, Kansas this summer! I put up just one Christmas tree this year instead of the usual 3 or 4 that I've been putting up since I moved here. 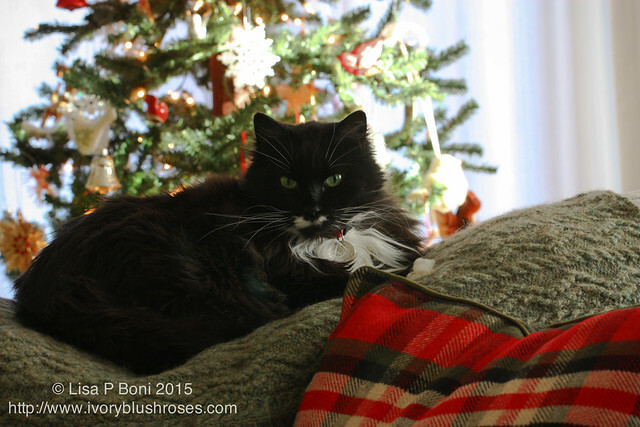 Kitzy Cat likes to sit on the back of the sofa on "her" afghan and enjoy it! 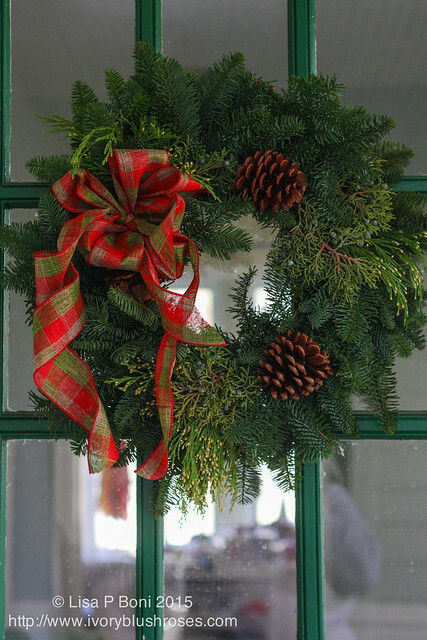 There is a fresh wreath on the side door. And a wintry centerpiece down the dining room table. 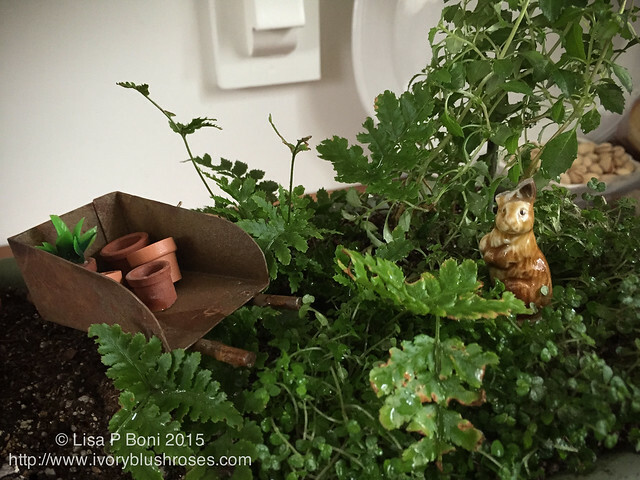 I've also had fun putting together a little "fairy" garden to go on my plant stand. Or rather, more of a Mr. MacGregor's garden. For years, I've been collecting little things to someday use in a doll house. How surprised I was to discover that most of the items I'd collected had to do with gardening! The little bunny is a fire survivor. It is a little Wade porcelain figurine that I've had for ages, but whose ears got broken a long time ago. He was so sweet, that I could never bear to part with him. He makes a rather rough and tumble Peter Rabbit! 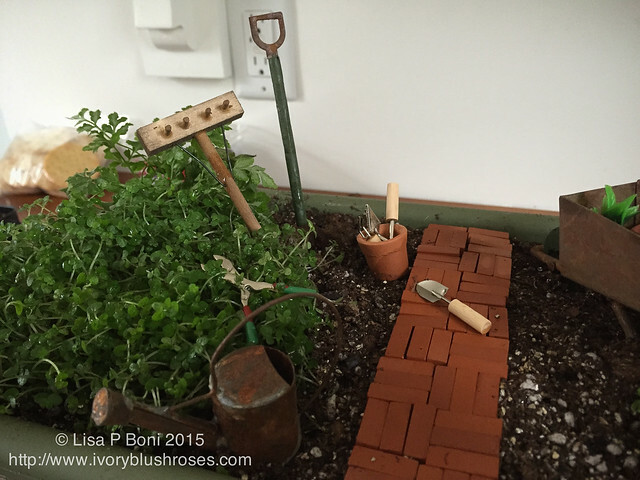 A little package of "to scale" bricks made a perfect garden path! And some perfect little gardening implements to go with! I hope to add a little fence and garden gate as well as an arbor and maybe some other teeny flowering plants along the pathway! Fun to dream and play with something like this! Definitely good for the soul and my heart's well being! 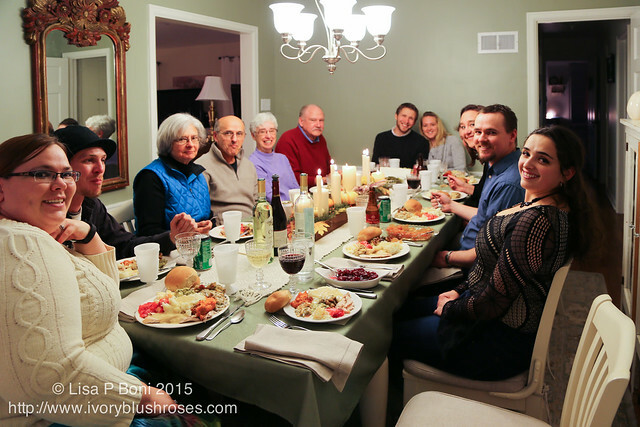 For Thanksgiving, I was blessed to enjoy all my kids around the table and a few of the in-laws! Few things make me as happy as having all of them around the table together! 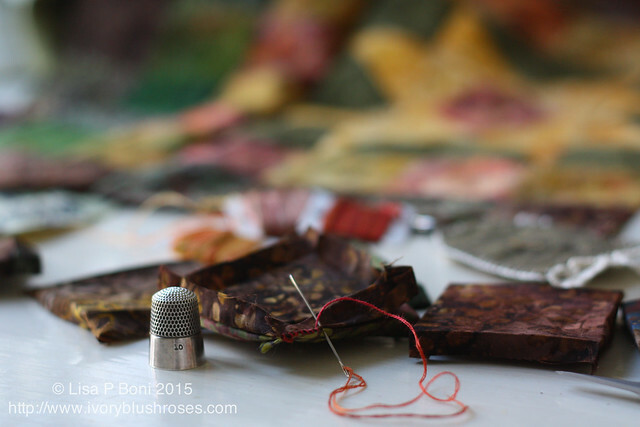 And yes, I have been doing some stitching... most of which I am not able to share right now. CQJP blocks have taken a backseat to getting Christmas gifts and commissions completed! 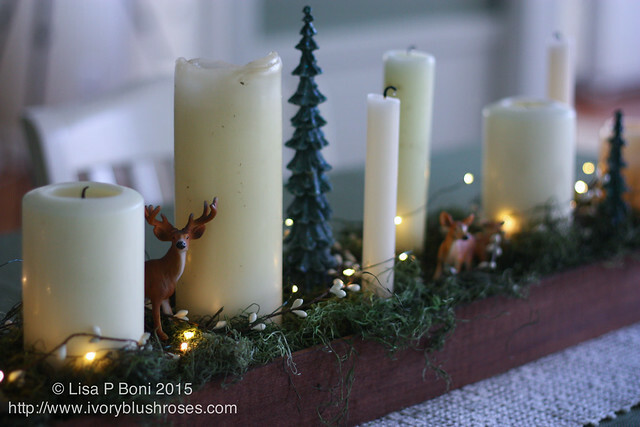 I hope you are all having fun with Christmas preparations and finding joy throughout! So good to see a post of yours. 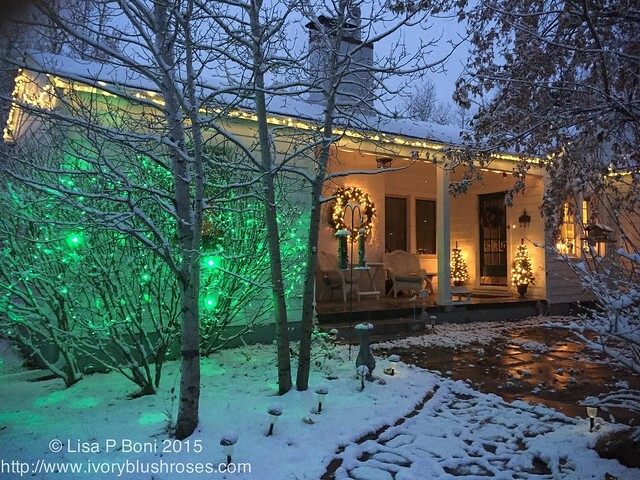 Your home looks so lovely for Christmas. Thanksgiving looks like it was quality family time with good things to eat. I'm sorry your hip is bothering you and pray that you'll soon be feeling better. gardens during the summer, but don't have enough indoor light during the winter. I will be praying for an answer to your hip pain. May the Lord bless you greatly as we celebrate the miracle of His birth. Pat S. of Lebanon, PA. Your home looks so beautiful and welcoming. Your miniature garden is darling. Your Christmas decorations look really lovely. Love Mr McGregor's garden! Your home looks spectacular! I've been late getting Christmas things out too and finally got my Christmas china out today. Lovely to see yours! 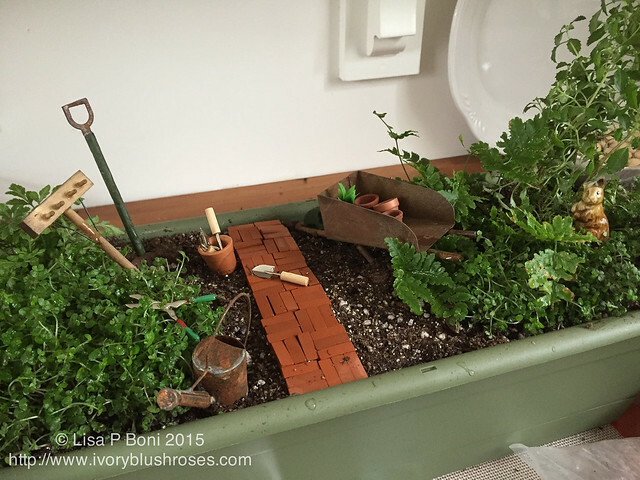 I love your fairy garden and my granddaughters would too! Have a blessed Christmas, Lisa. Your lights and Christmas decorations look so sparkly and pretty, but I must admit to being fascinated by your little fairy scene. I've always loved miniatures! The illuminations look like a paradise, Lisa! Your Christmas preparations are inestimable! How many glimmering garlands did you use I wonder?